It is almost impossible to remember that in the late Fall Brickyard Creek experienced soggy gray days, day after day after day. And while it was a bit of a downer and difficult to work outdoors, the higher than average temperatures lulled most into thinking we would have another mild winter. Certainly, dry air would arrive, and the seasonal checklist would be completed. Instead, as we all know, the thermometer went in the opposite direction, and the ordeals of a “real” winter began in earnest. In addition to reacquainting ourselves with the term “polar vortex,” Bayfield has so far received over 100 inches of snow. On the hill, some are saying closer to 150 inches. You know it’s legit when the talk at the post office is about the height of the snowbanks and questions regarding where March snow will go. Indeed, these same issues impact us at Brickyard Creek. Maybe more so because of our narrow gravel roads and driveways, the fickleness of little-used wells, and the need to shovel out holding tanks. Our snowplow operator has been pro-active and doing his best to find places to push it all, but it has been a formidable challenge. 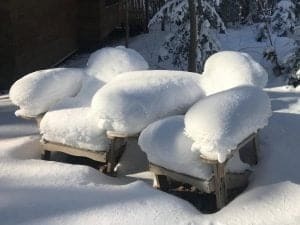 If you are making a special trip north to enjoy our “Wonderland,” it might be advantageous to make sure your home service provider has opened the walkway to your cottage and made a path to your holding tank. The septic companies will not empty a full tank otherwise. Also, if you think of it, I’d appreciate notification. This gives me the chance to make sure your place is ready for your arrival. Lastly, a reminder that containers of sand are available on the north side of the front entrance and at the corner of Sophie Lane. I just refilled them again over the weekend, so hopefully, that means it won’t be needed. I have had many asking about the conditions at Meyer’s Beach and the mainland sea caves. I believe some are still holding out hope that they might open this year, but currently, good ice has yet to form. That is not to say that there isn’t still plenty of activity in the area and it has been great to see many in Brickyard Creek taking full advantage. Of course, the snowshoeing and cross-country skiing is fantastic, and many have mentioned the thrill of driving over to Madeline to enjoy the peace at Big Bay (or a brandy at the Beach Club). Reason enough, I think, might be the chance to sit in front of a roaring fire and take in the beauty of the forest covered in white. I hope to see you here! In the meantime, please be looking for a complete report in the coming weeks that will share the highlights and accomplishments of 2018 and the goals, activities, and events for the year ahead. Perhaps most notably, an introduction to our new community website. Tony Jeannette, Zina Harrington, and I have collectively put in hundreds of hours to provide a first-class resource for our world-class community and local. We are in the final editing stage and plan to launch this Spring. I think you will find it a game-changer and a powerful communication tool to provide information and further our community identity and vision. This and so much more to look forward to. Take good care and please always feel free to contact me for any reason.